Samsung Galaxy Tab 3 10.1 P5220 4G Calling Android Tablet Review & Price. ~ All Android Smartphones Mobile Phones Tablets Review Price. Samsung Galaxy Tab 3 10.1 P5220 4G Calling Android Tablet Review & Price. 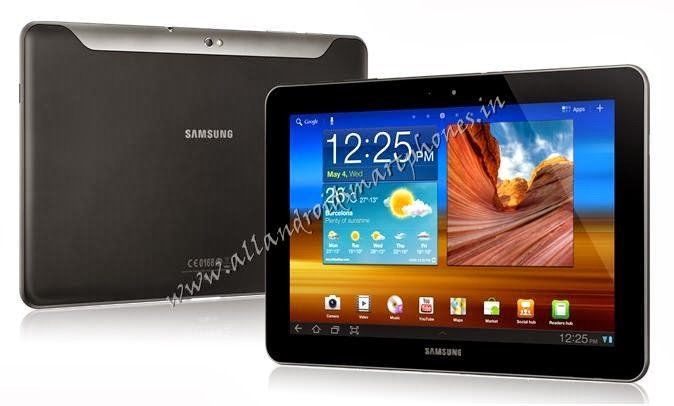 Samsung Galaxy Tab 3 10.1 P5220 is a 4G Calling Android Tablet with GSM voice communication, SMS, and MMS support. The Tablet uses a 10.1 inches multitouch 16M colors TFT capacitive touchscreen with 1280 x 800 pixels WXGA resolution and 149 ppi pixel density. It uses a Samsung TouchWiz UX UI user interface for smooth navigation and excellent screen sharpness. The tab dimensions are 243.1 x 176.1 x 8 mm and it weighs only 510 grams. The Android 10.1 inch screen Tablet supports loudspeaker with stereo speakers, Dolby Surround sound enhancement with 3.5 mm audio jack and Vibration, MP3 ringtones for sms notifications and call alerts. The tab comes in two variants 16 & 32 GB storage with 1 GB RAM and storage can be extended up to 64 GB using external microSD card. The tab uses a 3.15 MP main rear camera supporting 2048x1536 pixels resolution, video @ 720 pixels and geo-tagging feature. The tab uses a front secondary 1.3 MP camera for web chat or video call feature. The tablet uses a non-removable Li-Po 6800 mAh battery which gives a talk time of up to 8 hours. The tablet doesn’t support Radio FM feature for music and entertainment. The Android Tab comes in White, Gold Brown, Garnet Red, Midnight Black colors. Explore Samsung Galaxy Tab 3 10.1 P5220 4G Android GSM Calling 10.1 inch Tablet Features, Specifications, Images, Photos, Comments, Review & Price in India. The tab runs on Android v4.2.2 Jelly Bean OS with Intel Atom Z2560 chipset board, Dual-core 1.6 GHz CPU and PowerVR SGX544MP2 GPU supporting Accelerometer and compass sensors. The Tab supports GPRS, EDGE, 3G speed HSDPA 42 Mbps, HSUPA 5.76 Mbps, LTE, Cat3, 50 Mbps UL, 100 Mbps DL, Wlan Wi-Fi 802.11 a/b/g/n, Wi-Fi Direct, dual-band, Wi-Fi hotspot, Bluetooth v4.0 with A2DP, microUSB v2.0 (MHL 1.2), USB Host, Infrared port, threaded view SMS, MMS, Email, Push Email, IM, HTML5 browser, GPS with A-GPS support and GLONASS, Java via Java MIDP emulator, SNS integration, TV-out, Organizer, Image / video editor, Document editor / viewer, Voice memo / dial and Predictive text input. The tab runs on 2G frequency of GSM 850 / 900 / 1800 / 1900, 3G frequency of HSDPA 850 / 900 / 1900 / 2100 and 4G frequency of LTE 800 / 850 / 900 / 1800 / 2100 / 2600. The preinstalled apps include Google Search, Maps, Gmail, Picasa, YouTube, Calendar and Google Talk. The video formats supported by tab are MP4 /DivX /Xvid /FLV /MKV /H.264 /H.263 player and audio formats supported are MP3 /WAV /eAAC+ /Flac player. Other features supported are GPS tagging; HD Playback; HD Recording; Online Image Uploading (Share Via); Photo Editing; Sharing Capabilities: Buddy photo share, ChatOn photo share; Shot Modes: Auto, Beauty face, Night, Panorama, Sound & shot, Sports; TV/Video-Out; Video; Video Editing. Also check Acer Iconia Tab B1-A71 Android Tablet Features, Specifications, Images, Photos, Comments, Review & Price in India. 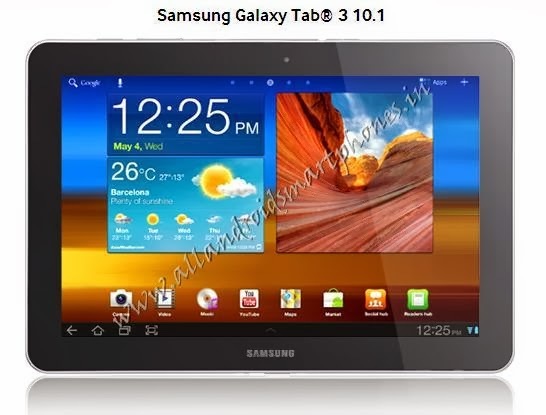 Features and Specifications of Samsung Galaxy Tab 3 10.1 P5220. 243.1 x 176.1 x 8 mm. LTE 800 / 850 / 900 / 1800 / 2100 / 2600. Android v4.2.2 Jelly Bean OS. 16 / 32 GB storage, 1 GB RAM. Yes, Available with Dolby surround sound enhancement. HSDPA 42 Mbps, HSUPA 5.76 Mbps, LTE, Cat3, 50 Mbps UL, 100 Mbps DL. Wi-Fi 802.11 a/b/g/n, Wi-Fi Direct, dual-band, Wi-Fi hotspot. microUSB v2.0 (MHL 1.2), USB Host. Geo-tagging, Video @ 720 pixels. SMS (threaded view), MMS, Email, Push Mail, IM, HTML5 browser. White, Gold Brown, Garnet Red, Midnight Black. SNS integration, Organizer, TV-out, Image / video editor, Document editor / viewer, Voice memo / dial, Predictive text input. Non-removable Li-Po 6800 mAh Battery. Watch Samsung Galaxy Tab 3 10.1 P5220 Unboxing & review Video. The Price of Samsung Galaxy Tab 3 10.1 P5220 4G GSM Android Calling Tablet with 10.1 inch WXGA screen in India is Rs. 25,950 /- only.